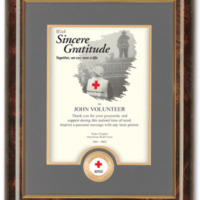 Photo of award used nationally by American Red Cross Chapters to recognize 9-11 volunteers and Red Cross donors. Designed by Lyn Franklin Hoyt of Berkeley Tandem, Inc. in Nashville, TN. When Lyn got the call from ARC NHQ to design this special award appropriate photography was not available yet. This image was digitally created from photos in the Red Cross photo archive to depict a moment that might have happened at Ground Zero. Later awards did show actual pictures from the disaster sites. But, this award and photo captured the moment and stood to represent the heroes and the visual story that unfolded that day on 9-11-01. 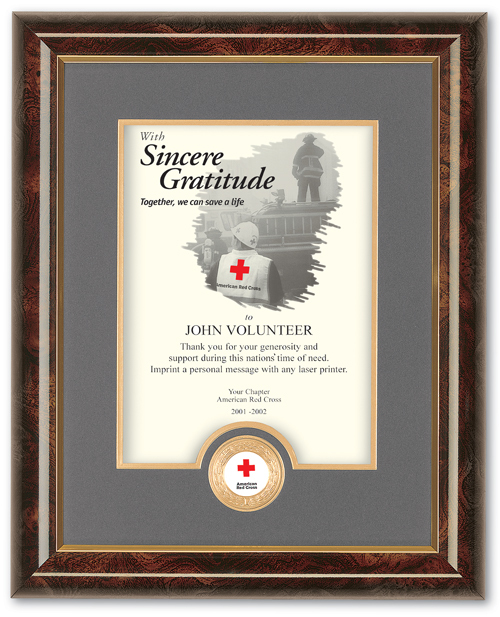 The inscription reads: "to VOLUNTEER Thank you for your generosity and support during this nations' time of need." Other text was then added to the certificate to personalize the inscription further. The human spirit was validated for me. It was alive through recognizing the 100's of selfless volunteers that poured onto the World Trade Center and Pentagon sites. I was proud to see this nation could still come together during time of need. And I am honored to be a part of their recognition as heroes. Lyn Hoyt, “[Untitled],” September 11 Digital Archive, accessed April 25, 2019, http://911digitalarchive.org/items/show/96772.